NASA astronaut Tom Marshburn, Expedition 34/35 flight engineer, participates in an Extravehicular Mobility Unit (EMU) spacesuit fit check in the Space Station Airlock Test Article (SSATA) in the Crew Systems Laboratory at NASA's Johnson Space Center. Image released July 20, 2012. Astronaut Tom Marshburn, who is gearing up to launch into space this month, will speak to SPACE.com during a live video interview Tuesday morning (Dec. 4) from the Gagarin Cosmonaut Training Center in Star City, Russia. Marshburn will lift off on a Russian rocket Dec. 19 at 7:12 a.m. EST (6:12 p.m. local time) from the Baikonur Cosmodrome in Kazakhstan. He will make the journey with Russian cosmonaut Roman Romanenko and Canadian Space Agency astronaut Chris Hadfield. The three spaceflyers will travel to the International Space Station to join its Expedition 34 mission. They will live and work in orbit for about five months before returning in May 2013. During their stay, the space station will have a busy period punctuated by visits from robotic cargo delivery spacecraft from Russia and commercial U.S. companies. In addition to helping facilitate the arrival of these vehicles, the crewmembers will maintain the space station and carry out scientific research. A native of Statesville, N.C., Marshburn holds master's degrees in engineering physics and medical science, as well as a doctorate of medicine. He worked as a NASA flight surgeon before being selected as an astronaut in May 2004. Marshburn's first trip to space was aboard the STS-127 mission of the space shuttle Endeavour, which flew to the space station in July 2009. During that flight he performed three spacewalks. SPACE.com's interview with Marshburn will be broadcast live on NASA TV at 6:05 a.m. EST (1105 GMT) on Tuesday. You can watch via our NASA TV feed here. 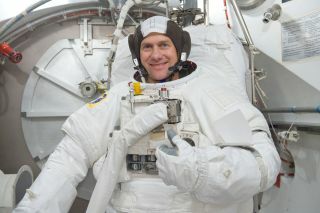 What questions would you like to ask Marshburn about his experience as an astronaut and upcoming mission? Reply in the comments, and we'll ask some of your questions during the interview.